For All of our products. On all UK orders over £150. New Crochet Along From Lisa Richardson. Home / New Crochet Along From Lisa Richardson. We are delighted to bring you the new Crochet-Along from Lisa Richardson. 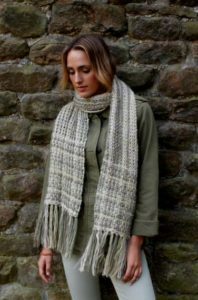 Using Cotton Cashmere and Kidsilk Haze, Lisa has combined crochet with weaving to create a stunning scarf which will be available in two colour combinations. The project will be supported by tips, tricks and how to videos and will be released in instalments. The design is available in two different colourways. Lisa’s Inspiration came from a resurgence of weaving that has been happening over the past few years and she loves incorporating this into crochet projects. She first did this with Colonsay in Rowan Magazine 58 then as a shawl and skirt/wrap in Rowan Magazine 63. It’s a very simple but effective technique and great for beginner crocheters. It also adds in a new element of weaving fun for all abilities! The addition of the Kidsilk Haze along with the Cotton Cashmere gives a beautiful softness. Club Members get access to free patterns, super specials and latest releases! © 2018 Lady Sew & Sew Knits.